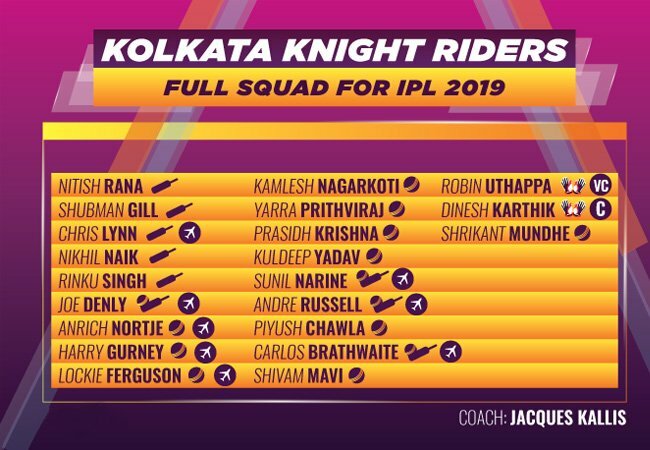 Kolkata Knight Riders, one of the most liked franchises in the Indian Premier League, will take field in the 12th season of the tournament with eyes set on their third IPL title. Becoming only the second franchise after Chennai Super Kings to win the title twice (2012 and 2014), KKR haven’t really been able to replicate their collective performance since then. With eight wins in 14 matches last season, Knight Riders finished on the third spot in the points table. While they defeated Rajasthan Royals by 25 runs in the eliminator, they failed to sneak past Sunrisers Hyderabad in the second qualifier. Coming on the back of what seemed like a well thought-out auction, it wouldn’t be wrong to say that Kolkata have arguably the best combination of experience and youth. While the likes of Shubman Gill and Shivam Mavi made their presence felt last year, one believes they will only do better from hereon. Their strategy in the auction also made sure that their starting combination will almost be similar to what it was largely in the last season. Knight Riders will have to ponder about their star opening batsman Chris Lynn. While he hasn’t played First-class cricket since 2017, one expects him to not feature in the same. However, if he is named in Australia’s ODI squad for the series against Pakistan, he might miss a significant part of the IPL. While Lynn and Sunil Narine make for an explosive opening pair, the former’s absence will make way for England opening batsman Joe Denly, who has earned his maiden IPL call-up. Experienced batsman Robin Uthappa will continue to bat at No. 3 for KKR. With him missing the game due to an injury since October last year, the franchise will be hoping for a swift recovery for him. In Nitish Rana and captain Dinesh Karthik, Knight Riders have a couple of batsmen who can take the attack on the bowlers at any given situation. With Rana being a left-hander, his presence adds variety to their batting line-up. Shubman Gill will be hoping for a promotion in the batting order for No. 6 isn’t the spot you associate him with. Till that doesn’t happen, he will have to continue with this unusual role of batting in the lower middle-order. All-rounder Andre Russell will look to bring his form across the border. Currently playing the Bangladesh Premier League, Russell has scored 255 runs in 13 matches at an average of 31.87 and a strike rate of 150.88. With the ball in hand, he has dismissed 12 batsmen at an average of 23.50, an economy rate 7.23 and a strike rate of 19.5. It wouldn’t be wrong to say that with his dual abilities, Russell will hold the key for KKR in this season. Rookie bowler Shivam Mavi might not have taken the number of wickets which a team expects from a new-ball bowler, but he was undoubtedly brave in how he bowled in the nine matches in his maiden IPL season. Expect him to start for the Knight Riders this year as well. The overseas bowler’s spot will go to one out of New Zealand’s Lockie Ferguson, England’s Harry Gurney or South Africa’s Anrich Nortje with Kiwi looking set to win this race. Kolkata Knight Riders are also expected to continue with their duo of wrist-spinners in Piyush Chawla and Kuldeep Yadav. Given how batsmen struggle against this breed of bowlers, one expects them to dictate terms in IPL 2019. Considering the year which Yadav has had in international cricket, he would be looking to make a significant impact with his bowling in this season for KKR.